Sippican Cottage: Is This The Most Popular Thing Ever Painted? Is This The Most Popular Thing Ever Painted? How would you measure such a thing? I imagine you could shove a copy of La Gioconda under the whole world's nose, and 99 out of 100 might recognize the old girl. But everyone knows who Hitler is, too. (This is the Intertunnel. Eventually everyone mentions Hitler) Recognizable is not the same as popular.Would you plunk down money for a print of Mona Lisa? I wouldn't. I live in a 1901 Free Classic Victorian, and I'd hang a Parrish print in any room in it. If the walls could take the weight, that is. 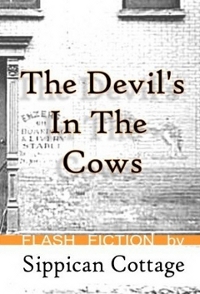 Bang a hook around here, and you might end up outside. Still, the urge is there. It is estimated that 25 percent of all the houses in the United States had a print of "Daybreak" by Maxfield Parrish hanging in them in the 1920s. That's popular. Leonardo could only sell the smirky woman once. Parrish made a pile on his nymphs. The actual painting changed hands in 2006 for $7.6 million. 7.6 mil will get you into the Louvre, it's true, but you won't be unscrewing much of anything recognizable from the walls for that sum, never mind the Mona Lisa. But that's a lot of money for an American painting. I think it means something. When I was younger, that painting was considered about par with Dogs Playing Poker by the intellectual set. I find lots of stuff like it having a bit of a renaissance recently. I'm not sure if the Intertunnel has anything to do with it. Say what you want about it, but the Internet does lend at least a veneer of democracy of interest to cultural things, even though it has huge blind spots. By Intertunnel standards, George Lucas painted the Sistine Chapel on a break from writing Shakespeare's plays, but it's still a useful way to see what people are interested in. Guys on the artistic "outs" like Parrish and Mucha and other contemporaries are comparatively everywhere on the Intertunnel. People are interested in them. That has not always been the case. Hell, Google even gave Mucha a Google Doodle salute on his birthday. Parrish paintings and illustrations were immensely popular in their time, and when the great, glum, decade of the thirties followed the ebullient twenties, I think people associated it with a burp from a sumptuous meal they'd already eaten, but they couldn't afford to buy a second time. It reminded them of plenty, and sackcloth and ashes doesn't do plenty. Parrish seems downright Byronic compared to the rest of the art world, living out in the woods in New Hampshire and tossing brilliant lightning bolts down on the world. The approach sounds familiar. Like all Romantics, he didn't want to settle for the world as it was, and so made one of his own. Or maybe the world really is like that, and all he did was transcribe it, and we're too glum to see it. I think Parrish begat Peter Max, didn't he? I bought a book of Parrish's work in the '70's; also, Escher. Some, well many, people think anything popular is crap, or "the artist sold out". I say it somehow targeted something in our brains. And then there are John Tesh and Keane (the big-eyed kids), for whom we're not so willing to express that sentiment. Still true, though. While driving back to New York on the the Mass Pike a few years ago, we received a call from a friend who is quite the serious Parrish collector: "Immediately head up to New Hampshire, go to such and such an address, and ask to see Parrish's 'Daybreak'". We proceeded as directed. A docent escorted us upstairs, where the original painting hung behind a plexiglass shield. A bench was provided for viewing, under the docent's watchful eye, of course. We sat there in awe. After a few minutes, we were escorted back to reality. As we needed to conserve our cash for tolls and gas, we declined to make an offer, but shortly thereafter the big sale went down. And I also like Rockwell and the Leydendecker brothers as well. Parrish was the son of an artist and begat one or two. His daughter Jean modeled for several paintings - Mary, Mary Quite Contrary (1921), Jack and the Beanstalk (1923), Evening (1921 or 1944), Knave of Hearts (1922, Prince), Dreaming (1928), and Ecstasy (1929) and Daybreak (1922, standing girl). She became an accomplished artist in her own right. I have "The Village of San Jose" one of her Southwestern landscapes on my wall. She fetches high prices in the right markets. I think Parrish was brilliant. 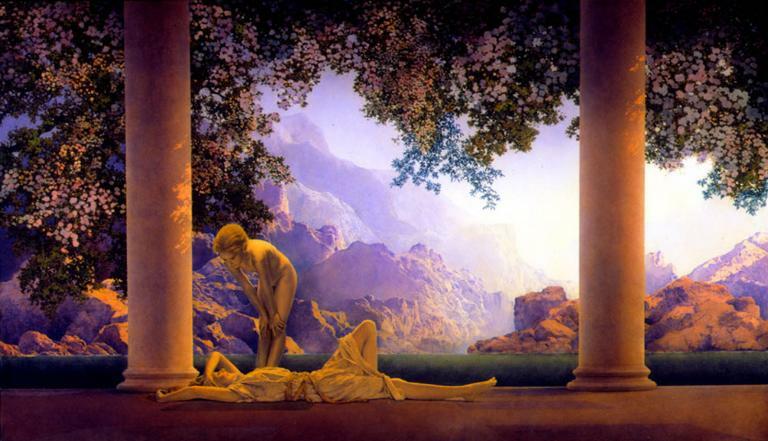 If I ever acquire an opulent billiard room, scented with Scotch and fine cigars, it should have a Maxfield Parrish. Readers might be interested to know that Norman Rockwell and Andrew Wyeth are ascending in popularity. The little bit of democracy available to the art world has spoken, and people love these guys (as do I). I just bought a second monograph of AW - his vision was so expansive, it is awe inspiring. But, I'm an eclectic who also loves Mark Rothko, so go figure. I hope art is never that well understood, or else there will cease to be new stuff. And Maxfield Parrish was "new stuff" when it was created. I think there's really a resurgence of the the entirety of midcentury American art. My guess is, it's the same sort of thing that prompted the muscle car boom in the 1990s. People who grew up with musclecars as their formative "this is what awesome looks like" experience, were coming into middle age, and money; and wanted to have what they had wanted as teens. Same thing. People who grew up seeing these prints hanging on their parents walls, and paintings in regional museums during field trips etc... are now in the "buying art" stage of their lives. Personally, if I could snag a nice litho of nighthawks, or "freedom of speech"... yeah I'd put it on my wall. Regarding Alphonse Mucha, do a Google search on "art nouveau" and switch to "Images". If it isn't Mucha's work, it is a derivative. 'Nuff said. @Casey, "I hope art is never that well understood, or else there will cease to be new stuff..." Beauty isn't a subject of understanding or knowledge, is it? It's mystery is to enrich that to which it pertains. It acts in concordance with other concomitants in this fashion, Truth, Justice, Wisdom, Liberty, Courage, and most mysterious of all, maybe, Love. 1) The publishing industry that let Rockwell, Parrish, and others make a living - and dictated their basic realism - is no longer. The internet will not replace it: digital "sampling" and photoshop "styling" have replaced draftsmanship. "Working from the model" now means googling for a photo that approximates what you want, or snapping one with your phone. 2) Realism keeps coming back to haunt the nihilistic modernist - and now postmodern - elitists. Every now and then art buyers get fed up with grungy conceptual trash, and demand some proof of actual skill, observation, and taste. Which is why realism came back in the mid-late 80s, and is with us again today. It's also why the decorative arts and industrial design are in a long-term boom since the postwar era. People trust and understand these works. And most craftsman-made items offer the promise of human scale and contact, which is sorely missing from the depressing, petulant tear-it-all-down message of the "Fine Art" world today. Ben David- Your comment was caught in the Spam filter for some reason, but I rescued it. Thanks for reading and commenting.